Native mostly to Madagascar and sub-Saharan Africa, chameleons are some of the most unique-looking animals on earth. From their hooded heads to their strangely shaped feet, chameleons possess a host of physical adaptations which have developed to help them survive. Some of these adaptations help the chameleon hunt, while others enable it to hide from predators. Chameleons possess a host of physical adaptations which help them survive. Their hooded heads help them collect water in the form of dew and to also impress mates. Swiveling eyes help them pinpoint fast-moving prey. Color-changing skin helps them blend in, stand out to potential mates and intimidate rivals. Their horizontal feet help them grip branches to keep from falling and to hold fast against predators that may try to carry them off. Many species of chameleons, including the veiled chameleon and calumma chameleon, have hooded or veiled heads. This hood is formed by a bony ridge on the back of the chameleon's skull. A chameleon's hood evolved to serve two main purposes. First, the hood helps chameleons collect water. Since chameleons often live in dry climates, and since their diets consist mostly of insects that do not contain much water, they need all the help they can get to stay hydrated. When dew collects atop of a chameleon's hood, the droplets eventually slide down the sides of the hood into the corners of the waiting chameleon's mouth. The second function of chameleon hoods has to do with reproduction. Male chameleons typically have larger, pointier hoods than females. When it is time to mate, male chameleons must sometimes fight other males to gain access to females. A male chameleon with a large hood appears bigger than he really is and can intimidate other males into staying away. Female chameleons also tend to prefer mates with larger hoods. This sexual selection ensures that the genes of large-hooded chameleons are passed on, and that future generations of chameleons also have hooded skulls. One of the chameleon's most interesting physical features is its oddly shaped, swiveling eyes. These eyes move independently of one another, rotating nearly 360 degrees. Because these eyes are on the sides of a chameleon's head, and because chameleons can switch between monocular vision (where they only see images collected from one eye) and binocular vision (where they see images collected from both) chameleons can see almost everything around them, including directly behind. This special vision allows chameleons to successfully hunt fast-moving insect prey like flies or beetles as they rush past. When a chameleon spots its prey with one eye, it swivels both eyes to lock on the target. It then shoots out its long, sticky tongue to snare the prey. Because a chameleon's eyes protrude so far from the sides of their heads, they require special protection. Chameleons have developed special, hooded lids which cover most of each eye, leaving only the pupil exposed. These lids protect the soft tissue of the eyes. As with its hooded head, a chameleon's famous, color-changing skin serves several purposes. First, it helps the reptile to blend into its environment. A chameleon's natural, unchanged skin color is different, depending on where it lives. Some chameleons are sandy brown, to blend in with bark and twigs, while others -- living in leafy treetops -- are varying shades of green. If the color of a chameleon's environment changes when it moves from a light green tree to a dark green one, it changes the color of its skin accordingly, helping it to blend in and avoid detection by predators. Chameleons also use their skin for temperature control. Like all reptiles, chameleons are cold-blooded, which means that they rely on the heat of the sun to warm their bodies. To speed up this process, chameleons sometimes make their skin darker, since darker colors help to absorb heat more quickly. Certain species of chameleon can turn their skin almost entirely black. One of the most important functions of a chameleon's color-changing skin is communication. During mating season, male chameleons often show off for females by turning their skin bright colors. Male chameleons vary their colors from bright oranges and reds to yellows and brilliant blues in bold stripes or striking spots to impress females. These colors communicate that a male is ready to mate. Male chameleons also try to intimidate other males with their colors. Reds, oranges, deep purples and blacks represent these aggressive colors in chameleons. A male chameleon may change to these colors to tell another male that he is ready to fight, or to try and intimidate the other male into walking away before a fight takes place. Chameleons have some of the most unusual feet in the world. Chameleons are the only animals with completely horizontal feet with toes that stick straight out to either side of the sole. Chameleon feet are sometimes referred to as being zygodactyl, like the feet of birds, but that is not an accurate description, since chameleon's toes are positioned very differently from the toes of birds. No animal on earth has feet like a chameleon. These one-of-a-kind feet developed for one purpose: gripping. 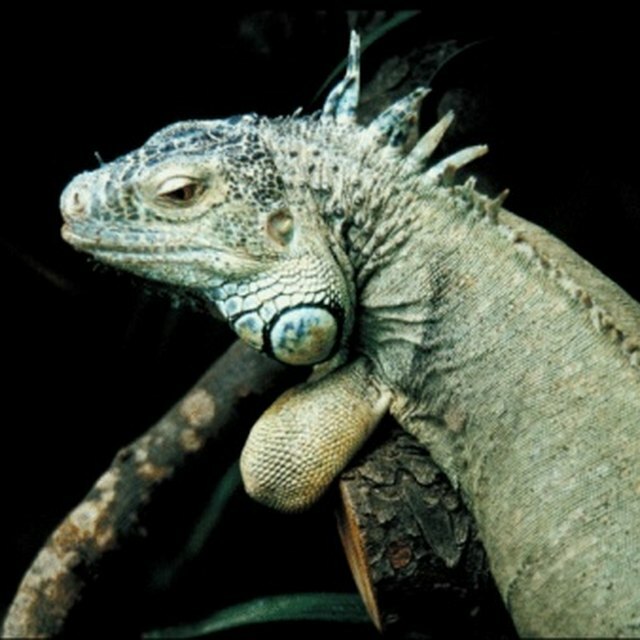 All chameleons live in trees or large bushes, where one slip could mean a nasty fall. But a chameleon's horizontal feet allow it to wrap its toes completely around branches and hold tight. A chameleon's feet aids in protecting the reptile from predators. Birds -- a chameleon's main predators -- hunt by swooping upon their prey and carrying it off in their talons. But a chameleon's grip makes it very difficult to pry it from a branch, even for large birds. When it comes to forest survival, few animals are better equipped than the chameleon with its literal head-to-toe arsenal of specialized adaptations. Cook, Maria. "The Adaptations of Chameleons." Sciencing, https://sciencing.com/adaptations-chameleons-8771909.html. 17 April 2018.